Following up next is our usual ATTO read and write tests. ATTO is an often quoted benchmark, because it is easy to use and accurate. For the most part, it is a favorite among reviewers, and I have grown to embrace it as much as the next for the last little while. 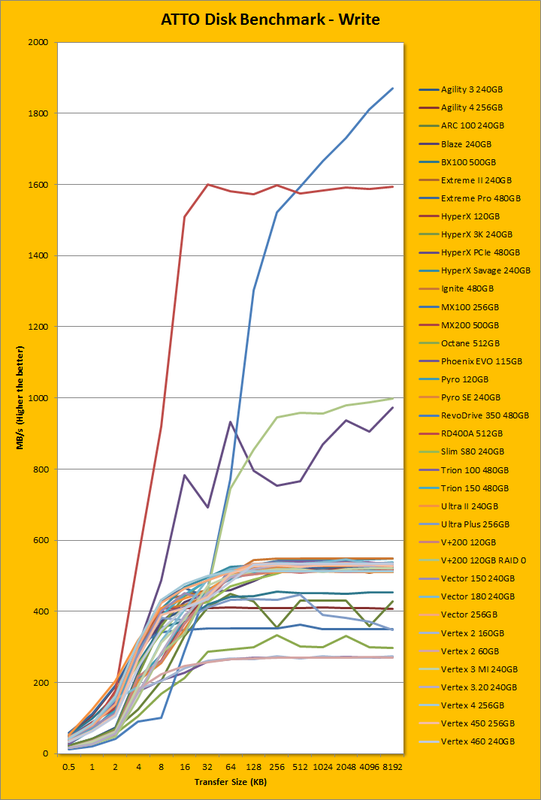 ATTO uses easily compressible data, so SandForce based SSDs and similar will perform very well here; as far as the OCZ RD400A is concerned -- well, here are our results. As manufacturer peak read and write performance ratings are usually obtained using ATTO, whether a drive lives up to its marketing claims or not can be validated by this program. OCZ claims the OCZ RD400A 512GB's maximum read and maximum write are pinned at 2600MB/s and 1600MB/s, respectively. According to our tests, these numbers were slightly underrated. It peaked at 2704.14MB/s read and 1600.847MB/s write. This is the best we have ever seen on this website. Under the curve, things looked a little fit funky. In the write category, we have seen faster ramp ups from 0.5K to 2K, but from then on, it quickly reached an impressive 919.519MB/s at 8K. The RD400A reached pretty much peak speed starting at 16K, which was quite mind blowing. In the read category, a similar observation could be observed. It was no match against the Kingston HyperX Predator PCIe 480GB's unbelievably fast 0.5K to 2K, but beyond that, the RD400A almost doubled the HyperX Predator at 4K with a whopping 606.559MB/s throughput, and broke the 1GB/s barrier at 8K. Meanwhile, the RevoDrive 350 purred along at the back at 90.413MB/s and 159.644MB/s at 4K and 8K, respectively. 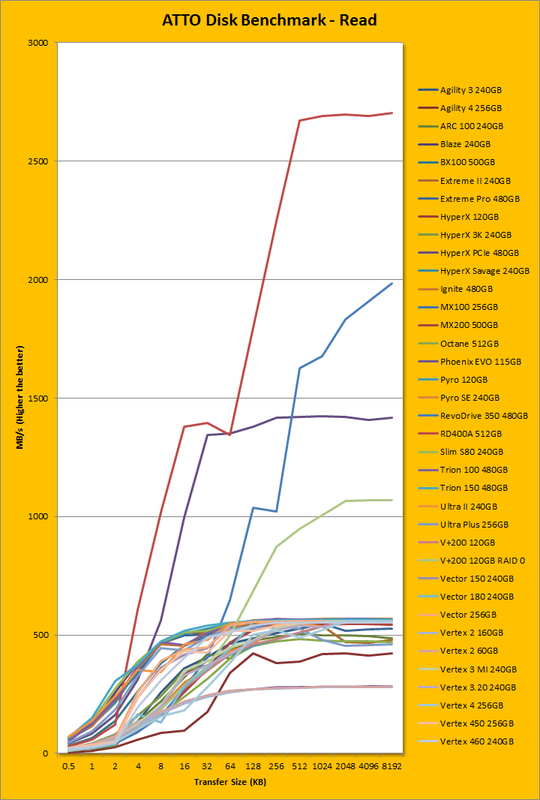 The RD400A 512GB was absolutely untouchable -- including the mighty OCZ RevoDrive 350 480GB -- across the entire board. Needless to say, the OCZ RD400A 512GB is the undisputed king in ATTO so far here at APH Networks.